Seniors Colin Johnson and Madison Gottlieb have joined the Preschool this week as part of their Independent Senior Projects (ISP). Both writers, the students are investigating the emergence of writing skills in the preschool child. Now an annual Preschool tradition, Family Fun Night brought current Preschool families and newly admitted Preschool families together for a wonderful night of pasta and puppets last Friday night. We have ducklings in the Preschool! We have incubated and hatched chickens before in the Preschool—in fact, two of our egg-laying hens in the coop are babies that were born here; but, this is the first time we’ve hatched ducklings. Easter time in the Preschool means dying and hunting for eggs, but it also means a chance to hone math and language skills and develop fine and large muscle control—and it’s a lot of fun, too! Students in Lower, Middle and Upper School gathered in Pasternack Field House last Friday for an instrumental music concert by the eight-member Hutchins Consort. The Hutchins Consort played on eight scaled violins of a violin octet designed and built by Dr. Carleen Hutchins. With instruments ranging from the tiny treble violin, tuned one octave above the standard violin, to the gigantic large bass violin, tuned one octave lower than a cello, the Hutchins Consort produced an astonishing pallet of sounds. Click here for photo gallery. Last week, Dr. John Vartanian visited the Preschool and the Lower School as part of National Children’s Dental Health Awareness Month and brought two friends to help demonstrate proper brushing techniques. Adorably costumed youngsters were naturally the center of attention at the 2011 St. Margaret’s Halloween Preschool and Lower School Parade. The days of Halloween celebrations began with a Preschool parade on Thursday, October 27 and continued with an encore on Monday, October 31, giving all children an opportunity to promenade past teachers, visiting parents, friends and classmates. To view Preschool Halloween Parade Photo Gallery, click here. To view Lower School Halloween Parade Photo Gallery, click here. For the final project of their introduction to engineering class, juniors Philip Bauer, Chris Howington, Takeru Inui, Brant Miller and Lara Ohanesian have made a solar powered box car. Just when the end of the year stress starts to creep in…clowns to the rescue! Two of the Early Childhood Development Center teachers, Lore Fredette and Shelley Harmon, put on a mime show last Friday to rival Cirque du Soleil. Eighteen happy preschoolers came back to school last Friday night for ‘dinner and a movie.’ They feasted on pizza and watermelon, made ice cream sundaes and watched animated children’s classic storybooks in the Performing Arts Center. 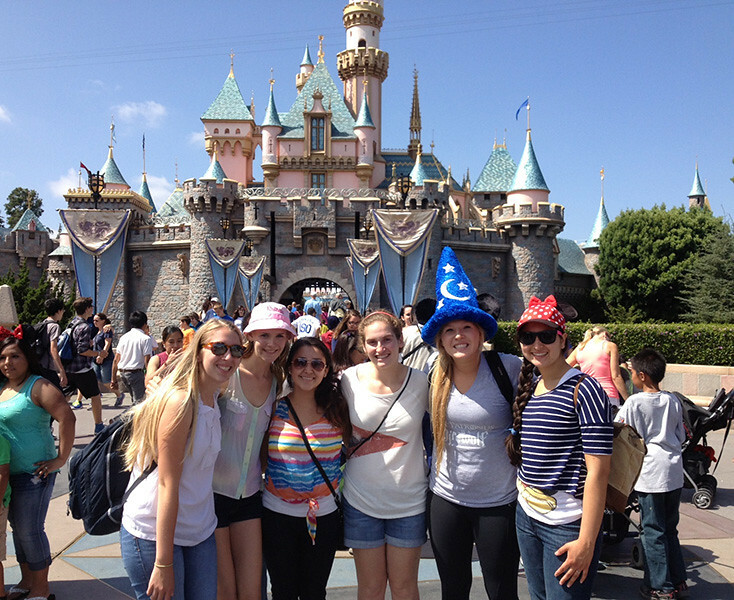 Members of the Class of 2013 made lasting memories at the happiest place on earth, Disneyland, as part of Monday's Senior Class Trip. St. Margaret’s Library Renovations are Underway! Ryan Dahlem Everest Summit Bid This Sunday UPDATED!